Berg Adventures is making the journey back to our spiritual home, Nepal, and this spring we’re taking a father and daughter team with us. Mark Garvin has first come with BAI Nepal on 2005 and from that time he has told us that he dreamed of one day bringing his daughter, Kylie to show her the beauty of the Khumbu. Well, Garv is back and Kylie is along! In addition two of the key BAI guides whom Garv remembers well from his first trek, Ang Temba and Min, are along for the adventure once again. 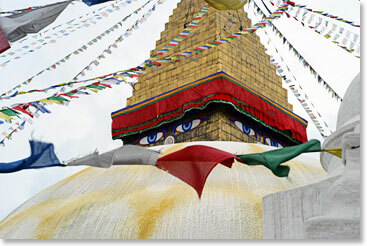 Together they will make the journey from Kathmandu to the Khumbu Valley and Chomolungma, Mount Everest. 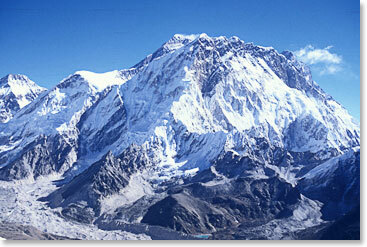 Goals include the summit of Kala Pattar at 18,300ft/5578m and a visit to Everest Base Camp at 17,500ft/5333m. Along the way they will experience the fantastic scenery of the world’s tallest peaks, visit remote monasteries and live in the warm and engaging culture of the Sherpa people. Stay tuned for our daily dispatches and follow along on this amazing once in a lifetime trek! April 22, 2016 – Our First View of Mount Everest! April 21, 2016 – We’ve Made it to Namche Bazaar! April 19, 2016 – Happy Anniversary Heather and Mark! April 17, 2016 – After 30 Hours Flights – We Finally Made it to Kathmandu!